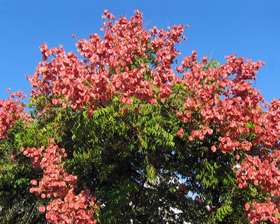 Koelreuteria elegant, also known as Golden rain tree, has a very elegant shape with ornamental appeal. 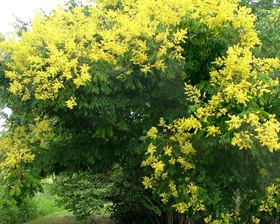 The Golden Rain Tree is one of the few trees to flower in mid-summer with elegant 30cm panicles of four-petalled, yellow flowers. The flowers are followed by lime coloured seed pods which start off green and age to a papery, golden red by autumn. It will give an especially fine display in warm, sheltered sites. The dark red bark is striking in winter and contrasts handsomely with the young pinkish-red foliage produced in spring. In autumn, the leaves turn bright yellow. Sow at any time of year. Store seeds in a fridge until you are ready to sow.Pre-soak stored seed for 24 hours in warm water. If they swell up then sow in a cold frame. If they do not swell then soak it for a further 24 hours in hot water (50°C) prior to sowing. This should cause the seed to swell but, or use scarification method. Alternatively sow seeds in autumn.